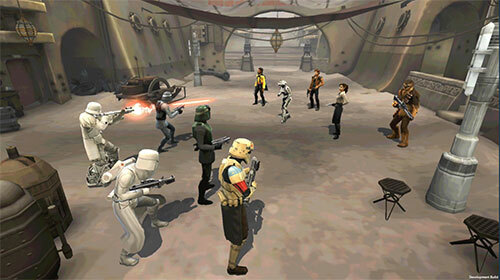 Welcome to the latest article in our series about the popular game Star Wars Galaxy of Heroes where we take a look at the best mods for each SWGoH character. While I do not claim to have all of the answers in this game, I do my research and have used every toon I write about extensively. These are mod recommendations and they are certainly not the only option. However we look to help players maximize their characters in SWGoH and we are always open to feedback if you have a mod setup that works well of your gameplay. Today’s toon to review mods for is one of the stars of Solo: A Star Wars Story – Young Lando Calrissian. While there are similarities to the other Lando Calrissian in Star Wars Galaxy of Heroes, this version of Lando is part of the Prepared series of toons along with Young Han Solo, Vandor Chewbacca, Qi’ra and L3-37 from the new movie. Let’s take a look at the early thoughts on the best mods for Young Lando Calrissian. Main Focus: Critical Damage. Young Lando Calrissian has a kit that is geared toward CC/CD as the boost in his Offense as he can hit very hard, so build on this strength in his kit. He has +15% CC & CD when buffed and +15% CC & CD when Prepared, and at 64.45% Critical Chance when maxed out at Gear 12+, you can expect a lot of crits. Additional Areas to Focus: Speed, Potency, Critical Chance, Offense and survivability. Speed remains a necessary evil in SWGoH, so be sure to get mods with high Speed secondaries on YLC to ensure he gets to use his strong kit. Potency will help both his basic and his special, Hot Hand, inflict debuffs to maximize your chances in battle. I list Critical Chance here only is you are using him under a lead that does not give CC bonuses or you have him below Gear 12. Under a Qi’ra lead you get +20% CC, which means that if Young Lando is either prepared or buffed under a Qi’ra lead he will have over 99% CC and over 100% if all of these are in place. Offense is important to help the hits cause more damage as well, but CD is a better route for YLC. Finally, add any survivability you can – Defense, Health or Protection. Scoundrel allies recover 10% Protection whenever they score a critical hit under a Qi’ra lead, so this is likely your best option of the three. In-game Mod Suggestions: Offense & Critical Chance. Young Lando’s kit is designed to be heavy on CC and has CD that can build as well, so I am not sure what is up with these in-game recommendations. There is no need to use a CC set when a maxed YLC who is both buffed and prepared can hit 94.45% CC with nothing from mods, so my recommendation is to ignore what they suggest in-game and go with CD and Potency if you have YLC maxed or close to it, but a CC set may help you if using him in-battle often at Gear 11 or lower. 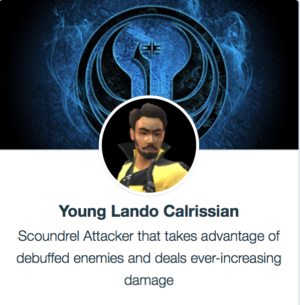 Be the first to comment on "SWGoH: Best Mods for Young Lando Calrissian"